This book wasn't what I was expecting with a spotlight on Raven. 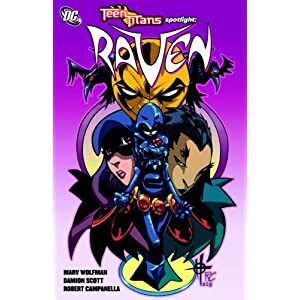 I was used to two different kinds of Ravens - the cartoon version from the Teen Titans cartoon, and the older mentor Raven from the comics. This Raven is after her battle with (I believe) Trigon's followers that were using her to try to bring him back. Her physical body was lost so the connection could be permanently severed, and she found herself in a newer, younger body. The novel shows her first days in a new school, getting used to what was happening around her, how her new body worked, and dealing with some pretty frightening visions. The artwork is slanted a bit more toward the anime than to the classic comic. New Raven is incredibly cute and it's interesting seeing her find her niche in this private school. Watching her try to figure out what the cause of the visions are and her role in them was a real page turner. You had no idea if she was going to be the cause, or if she was going to have an effect on things. There were bits that I wasn't expecting (and I don't want to give too much away) and more than a few people that I felt sorry for. I'm a Raven fan, and I really did enjoy this one. Even if it wasn't what I expected, I'm glad that I took the time to read it. Now I just need to find a bit more of her original storyline.